Last wednesday I cooked at the hospice. As you might know a hospice is a place where you can spend the last days of your precious life with your family close by, in dignity and with specialized care . My plan was to make pizza as promised to one of our guests. I spoke with him last friday and he was looking forward to his favorite dish. How sad it was when he was not able to eat this day. The people in a hospice are most of the time very modest eaters, so you have to plate up with care. We have six guest rooms in the house. of wich two with guests at the moment. The other guest is a mother of two children, a small bowl of soup is what she can handle. Since there are no visitors on the list to have a meal with us, I run out of eaters. But help is on its way, her daughter of 12 likes the idea of pizza. And within no time she is with me at the kitchencounter. As always the soup comes first, since it feeds the guests, professionals, the volunteers and the visitors. 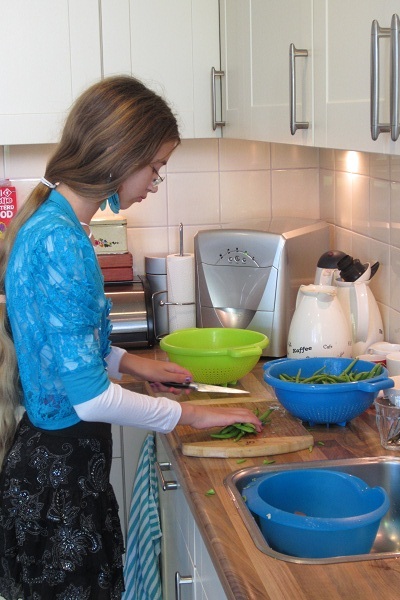 Alongside we cut the onions, a little attention to her cutting, we don´t want meat in this soup. We both take a sack of runner beans to clean. There is a lot of handling and concentration involved, so it is a good way to set your mind free. Frying the garlic, stirring the onions, adding the curry. The house fills with nice flavours and with that becomes a home. The dough for the pizza we make on the countertop, a little ring of flour, yeast and an egg in the middle, and my kitchen help makes her hands dirty. This is so nice to do, you should try it yourself. By times I see a little smile on her face. I am being paid in full by this. The sauce we make from a diced onion with garlic baked, some tinned tomatoes drained, together at a simmer for 15 minutes, finished with chopped basil, mmmmmmm. My beautiful assistant assembles her own pizza, just tomato sauce and some cheese, and within 10 minutes she enjoys her own piece of art. 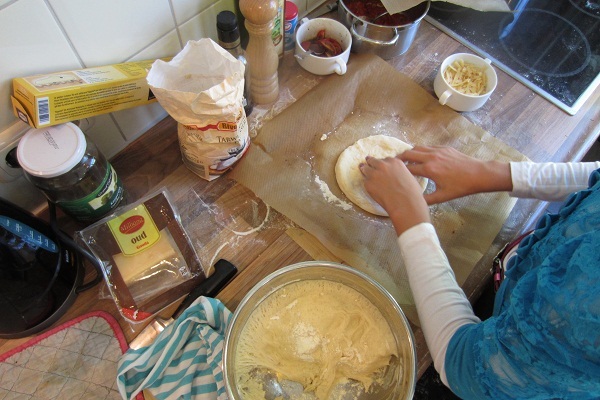 A second pizza she makes is for her brother and father as they will visit this evening. The kitchen table by now is attended with, relatives, volunteers and personal, who all enjoy a slice of pizza as one family. Wow what a good feeling soulfood can give us. Pizza ALWAYS brings ME joy!!!! Ze zijn ook overheerlijk, bella Italia! Dat je er nog veel voor ons mag maken.